We all have those days – those days when you have way too much on your plate and you don’t know how you’ll get it all done. It’s days like this when the last thing on your mind is dinner. Often times, I get so caught up in my work that I totally forget about dinner. Most days I really love my job, but sometimes things tend to get hectic. On those days when I have several articles to write, photos to shoot, parties to plan and soccer games to attend, I can get totally overwhelmed! That’s why I always have a backup plan! On those days when I don’t have time to cook, I keep my freezer stocked with Banquet Mega Bowls. Have you seen them? I find them in the frozen meals freezer section of my local Walmart. My husband was pleasantly surprised the first time I served him a Banquet Chicken Fried Steak Mega Meal. He’s impressed that the portions are hearty and the Chicken Fried Steak tastes homemade. Plus, this mega bowl has 19 grams of protein! The Chicken Fried Steak Mega Bowl is a favorite at my house. It’s filled with tender chunks of beef patty fritters and country style gravy on a bed of creamy mashed potatoes. Then it’s topped with corn, green beans, and melted cheese. It’s truly a mega bowl of deliciousness! 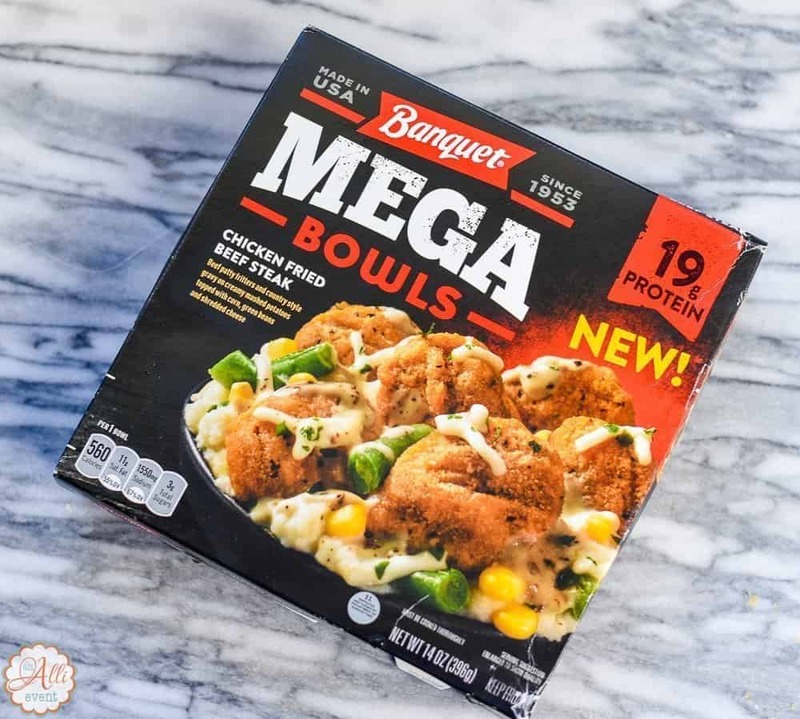 I’m all about saving money when I’m restocking the freezer with Banquet Mega Bowls, so be sure and check out the Ibotta Offer below. Check out this Ibotta Offer: Earn $0.50 off 1 Banquet Mega Meal or Banquet Mega Bowl! 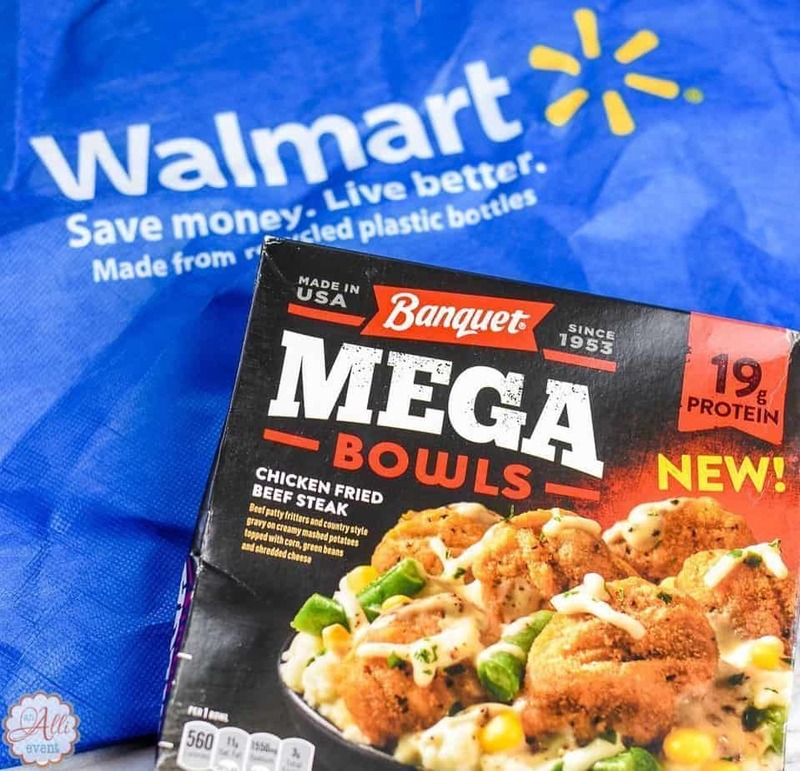 Banquet Mega Bowls and Banquet Mega Meals leave you full without emptying your wallet. Plus, it’s nice to have them on hand when I need a quick dinner. I need to check the freezer and see if it’s time to stock up again. How do you handle dinner on hectic days? I try to prep ahead as much as possible. If not, I always have freezer meals ready when needed. I hate feeling rushed at dinner time. 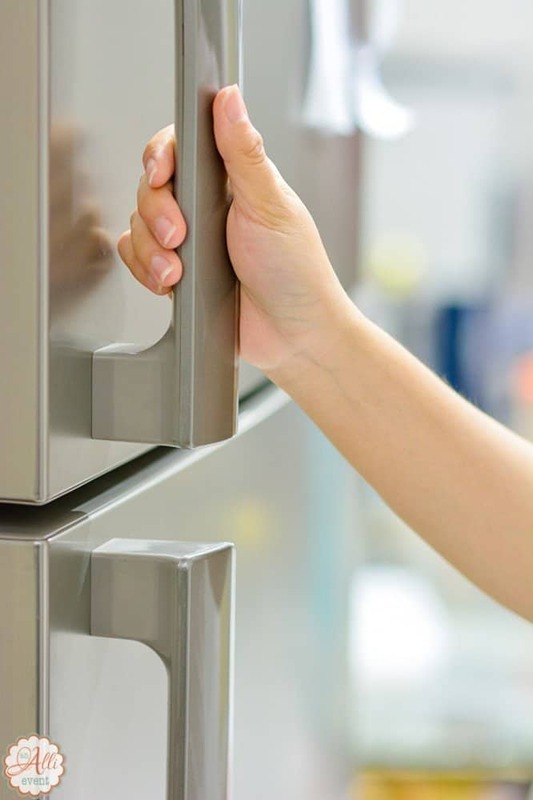 I always keep a freezer meal on hand for hectic days, especially during the holidays. It’s so easy to get overwhelmed at this time of year! Oh yum, these meals look tasty! I personally love when we just have frozen meals for dinner since I hate to cook. I’ll have to pick these up the next time I’m at Walmart. I can’t believe it but recently I’ve even been too busy to plan crockpot meals! 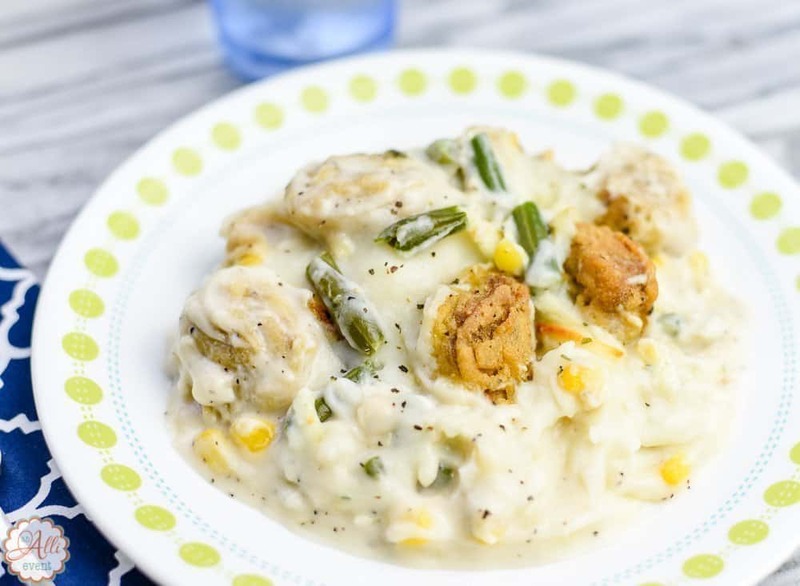 These frozen dinners are fantastic to fall back on – they are so simple! These look yummy and with an adult daughter living at home right now I can see some of these in her future! It’s hard to come home and cook after a long day at work. I really need to pick up some Banquet Mega Bowls! This post has me drooling! They look SO good and YES I need meals that are fast and easy to prepare especially around holidays! I think we all do! How great does this sound, I am always after ideas for meals that are quick, easy and tasty as I can’t stay standing for long in the kitchen. Getting supper ready between after school pick up and extracurriculars is enough to drive anyone crazy! I usually plan to have something super quick on those crazy evenings or make sure something goes in the slow cooker first thing in the morning. These Mega Bowls sound delicious and convenient. I would love to try one of these for those busy weeknights. They sound great! We run into lots of last-minute situations! Having some delicious Mega Bowls for those occasions is a good idea. I have spent many meetings thinking about what to prepare for dinner. Mega Bowls sound like such a life saver. I don’t usually have many last minute moments, but they do arise and this would definitely help keep things together. These meals look very tasty! 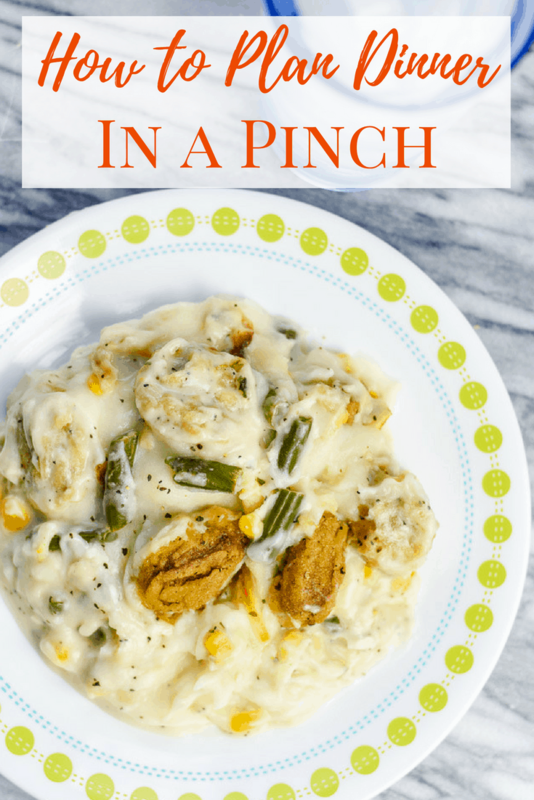 I would love to try cooking this for busy weeknight dinner! I love Banquet frozen meals when I’m in a hurry. I haven’t tried these bowls yet but will pick some up when I go get groceries this afternoon. It really does look delish. We all need to have a backup plan because dinner does not always go exactly as we think it might! I keep frozen meals in our garage freezer just in case we need them! I seriously need to get better about cooking dinner… We eat out way too much which is neither healthy or good for my wallet. Oh my gosh! I never thought in a million years that was going to be a banquet meal! It looks so good!